Our Quote of the Week reminds us that in a modern world, we cannot conquer our biggest social challenges if we remain in isolation. We must be aware of our interdependence and work together for the common good. "At the heart of a human rights view of society stands the concept of the person, a spiritual being set apart from the rest of creation with a capacity for thought, generosity, friendship and love. The unique character or nature of the person means that he or she is possessed of a spectrum of rights, moral claims which can be asserted as a means of defending personality, property and privacy and enhancing his or her human potential." Sargent Shriver repeats a key word, universal, several times, making assertions about the rights of all human beings everywhere. He makes the case that we all have the right to live in freedom, with dignity and access to justice. If then, we all have the same rights, and we are all connected, it stands to reason that a large-scale attack on anyone's rights is an affront to all of us, and we must work together to address it. Today's news stories remind us every day that large-scale human challenges and tragedies cannot be contained within a country's borders. Natural disasters, war and other forms of violence -- any human struggle of this type will sooner or later spill over a country's borders to affect the rest of us. It is in these moments that we must remember our interdependence, and act in a way that protects our most vulnerable sisters and brothers. Like this quote? 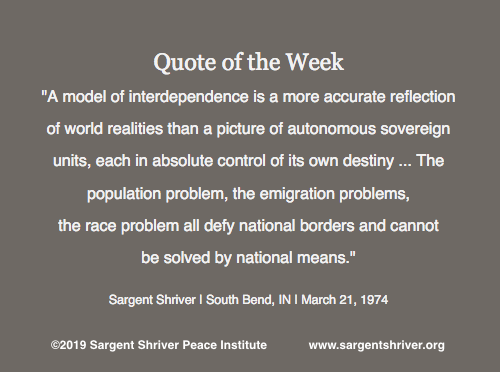 Read the speech and subscribe to receive our Quote of the Week by email.